And that’s where this Pan started its rebirth. Having purchased and shipped this bike to Australia, my best mate Joe and I started dismantling it only to find layer upon layer of bad workmanship. What started as a quick makeover became a major overhaul. We stripped the bike completely and had the frame blasted. We set about filing, grinding and re-tig welding each part of the frame to make good the previous bad work and filler that had been applied. Once we had agreed to keep the existing frame we developed an aesthetic direction for the bike, that being, an amalgamation of ideas from many bikes that we had both owned previously and some we still owned. We were starting from scratch and because of this we wanted to see if we could push the design a touch more than your run of the mill Pan chop. I also wanted to try and establish with this build my workshop business MACHINE as a builder of quality one off motorcycles. I did not want to have the workshop pigeonholed as a builder of just one type of motorcycle or another. I wanted to be able to cross over the marques and the types that had made an impression on me having been involved in motorcycles for the last 25 years. 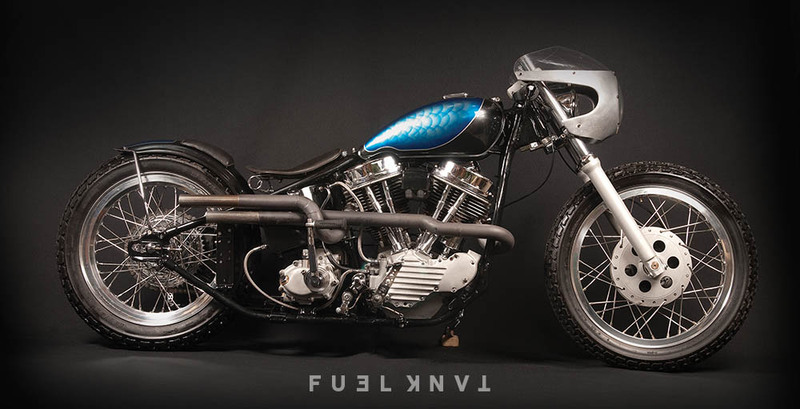 The build was completed over a period of nine months and included long hours agonizing over very small details that had been tried and proven on my ‘48 pan but refined in this build. These included: rear brake linkages, clutch setups, mid control setups, carb and manifold positions and various other elements. All this, overlaid with the vintage idea of lightening the bike as much as possible in order to make it faster led me to pursue a design that resulted in the bike you see here. All fabrication and paint done by hand at MACHINE. Thank you to Joe for always believing in the cause and to my beautiful wife who loves me even when I’m totally consumed by all the impenetrable things that I adore so much.